Mount Bizan is very close to the center of Tokushima. You can ride the Bizan ropeway up part of the way and get a good view of the town. 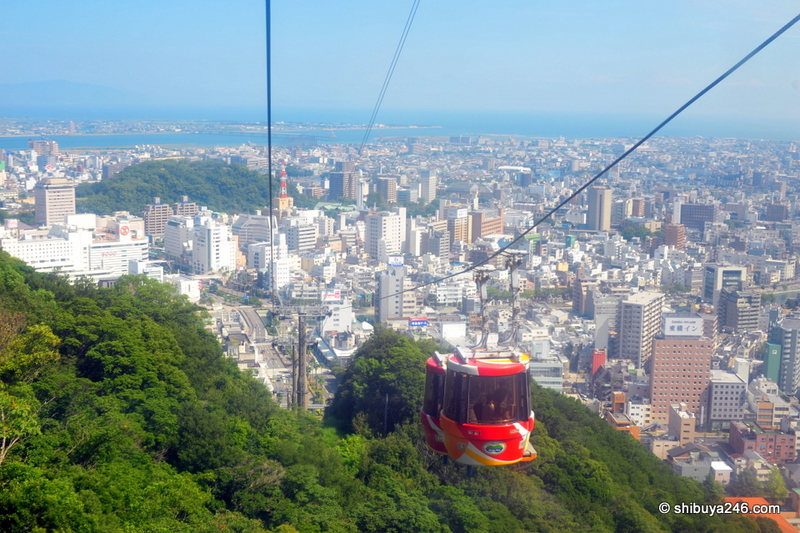 The ropeway starts inside the Awaodori Kaikan about 15 minutes walk from Tokushima Station. Somehow, I’m always afraid of cable car 🙂 It’s probably the latent tought of ” my life is litarly ON THE LINE here” hah. Had a foreign friend that when we went to Cologne totally wanted to ride the extremely long cable car ride over the Rhein river. I didn’t calm down for the whole trip as it was very windy and it just kept swinging everywhere – offcourse the touristy friend was LOVING IT. Heh. But ! Great pictures here again, as I said yesterday i’m really loving seeing views from area’s you’d normally never hear about when people talk about Japan; it’s mostly only about central Tokyo, or Kyoto. Amazing view. I went on the Hakone ropeway and was awestruck at the view. Sounds good. Maybe I should try that as well. Check out the Hakone Freepass which is good for two days and lets you use multiple forms of transport including the ropeway, pirate ship on Lake Ashi and various trains & buses. Best little two day getaway I’ve done while in Japan and its so inexpensive. I like the old mixed with new buildings like they do in Japan, makes it somewhat a tribute to tradition. Clean shots from above! Must have been fun, ne? These are some really nice shots. They make me wanna go there the next time I visit Japan. In general I love your photos. They give me the travel bug.